Hey everyone. I know it has been a while since I wrote something. I have been busy with multiple, large scale projects during the past few months, so I was almost always too tired at the end of the day to compose a new entry. I also had to relocate; I think the adjustment phase also took a lot of my time and energy. Anyway, what I am going to try to do now is to write short, straight to the point tutorials about how to do specific tasks (as opposed to going into more detailed, wordy posts). I will still write the elaborate ones, but I will be focusing on consistency for now. I have been working on a lot of interesting problems and relevant technologies at work, and I just feel guilty that I do not have enough strength left at the end of the day to document them all. Let us start with this simple topic just to get back to the habit of writing publicly. I have been configuring Linux VMs for a while now, but I have not really written anything about it, aside from my series of Raspberry Pi posts. 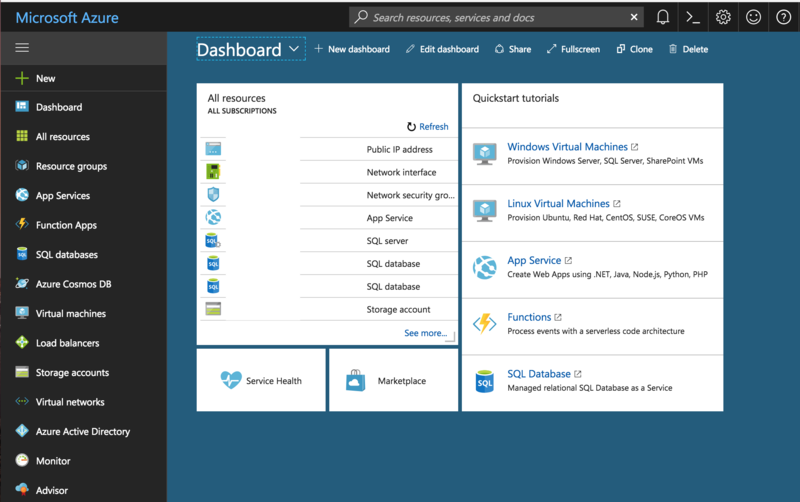 Also, it is my first time to work with the Azure platform, so I thought that it might be interesting to write about this today. This tutorial will assume that the Ubuntu 16.04 VM is already running and you can SSH properly into the box with a sudoer account. You can read about the official steps here. If you prefer looking at just one post to copy and paste code in sequence, I will still provide the instructions below. If so, let's continue with the next steps! I will not get into the details of how to create and manage MongoDB databases and collections here, but let us go into the processes of creating a root user so we manage our database installation remotely through this user. Now that we have MongoDB installed and running, we need to make some changes with the mongod.conf file to enable SSL and to make our MongoDB installation accessible on our VM's public IP and chosen port. If you already have a certificate or you just bought one for your database for production use, feel free to skip this step. I am just adding this for people who are still experimenting and want SSL enabled from the start. More information regarding this can be found here. This self-signed certificate will be valid for one year. This .pem certificate is the one that we will use on our mongod.conf configuration file. This command will save it on your home directory (/home/<username>/mongodb.pem or ~/mongodb.pem). Now that we have our self-signed certificate and admin user ready, we can go ahead and tweak our MongoDB configuration file to bind our IP, change the port our database will use (if you want to), enable SSL and to enable authorization. I use vim whenever I am dealing with config files via SSH; you can use your favorite text editor for this one. Now, if you try to connect to your database using your favorite MongoDB database viewer or by using the Mongo CLI on your local machine, you might notice that you will not be able connect. 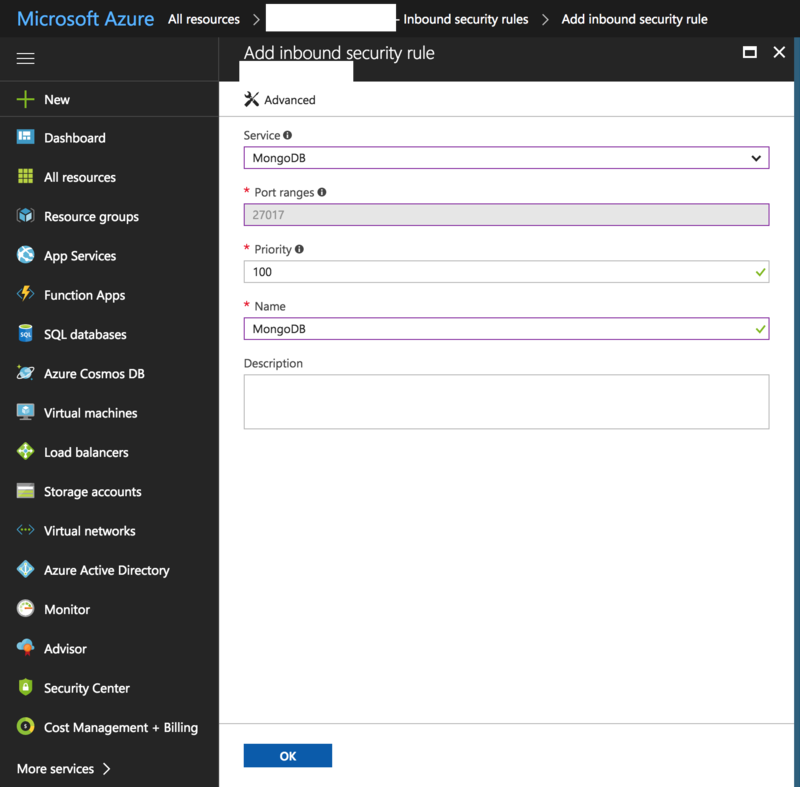 That's because we need to add an Inbound security rule on the Azure portal first. Once on the Dashboard, click on All Resources. Click on the Network Security Group associated with your VM. From here, you can see a summary of all the security rules you have for your virtual network. Click on Inbound security rules under Settings on the left pane. Click Add. You should be able to see a form with a lot of fields. We are used MongoDB's default port, so we can just click on Basic at the top so we can select from a list of preset ports. Just click on OK, and we are done! You can start connecting to your MongoDB installation using your tool of choice.